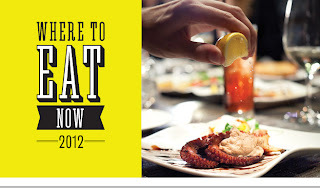 Toronto Life has come out with a great article called "Where to Eat Now 2012." The article features, Best New Restaurants of 2012, Flavours of the Year and Trends We Love & Hate. This is a great read for any food lover out there! Firstly it will introduce you to a ton of fabulous new restaurants for Toronto's food scene. The Flavours of the Year will show you different food trends that are similar and where they are happening across the city! You will also see some of the "food" or "dining" pet peeves!